The Yale Young African Scholars (YYAS) Program recently completed its annual academic program for outstanding African high school students. A flagship program of the Yale Africa Initiative, YYAS seeks to provide students with the tools, knowledge, and resources to pursue various opportunities for tertiary education around the world. The 2018 edition took place in Gashora, Rwanda (29 July – 07 August), and Tema, Ghana (11 August – 20 August), bringing together a total of 303 students from 35 African nations who attend 235 secondary schools on the continent. Over the course of ten days, participants were introduced to the demanding university and financial aid application processes and requirements, as well as standardized test preparation. The program also sought to foster critical thinking, develop key communication skills, and broaden students’ horizons by offering in-depth overviews about liberal arts colleges, gap year programs, and various institutions of higher learning in North America, Africa, Europe, and the Middle East. Twenty Yale undergraduates and undergraduates—the majority of whom grew up in Africa themselves and already have an in-depth understanding of university admissions processes, both abroad and within an African context—served as instructors and mentors to the YYAS participants. These Yale students were responsible for designing, implementing, and teaching seminars and discussions on a variety of topics across the arts, humanities, social sciences, and STEM fields, and served as mentors during smaller workshops. YYAS participants also attended lectures by Yale faculty and local practitioners who are all experts in their respective fields. Following each lecture, students had the chance to engage in intellectual debates and gain firsthand exposure to learning in a discussion-based environment. In addition, students interacted directly with admissions representatives and developed a deeper understanding about university and gap-year admissions, as well as financial aid applications. Following the program, YYAS will pair each participant with a mentor who will provide additional guidance throughout the university application process. YYAS also includes several experiential activities geared toward the development of core leadership and team-building skills. During the session in Rwanda, for example, participants heard a presentation by Hatim Eltayeb, Dean of African Leadership Academy in South Africa, on ‘one’s life as a movie’. Those in Ghana had a conversation with Alex Asiedu, a former Maurice R. Greenberg World Fellow at Yale University, who shared his experience of studying abroad and juxtaposed that story with the need to develop Africa’s potential at home. Two educators’ conferences for teachers, headmasters, and advisors from African secondary schools in the western, eastern, and southern regions of Africa ran concurrently during the YYAS sessions. These events were organized and facilitated by YYAS’s three partnering mentorship organizations: Ahaspora Young Professionals Network in Ghana, Imbuto Foundation in Rwanda, and Education Matters in Zimbabwe, all of which work on providing education access in Africa for low-income students. These conferences introduced educators to university guidance strategies and resources that they can then bring back to their respective schools and organizations and pass on to students who want to pursue post-secondary education abroad. The YYAS program is made possible through the support of Higherlife Foundation, as well as by contributions from The Whitney and Betty MacMillan Center for International and Area Studies at Yale. 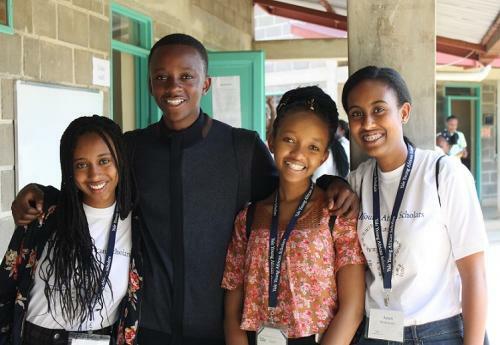 Building on the success of Yale’s initial three-year partnership with Higherlife Foundation from 2016-2018, YYAS will soon enter its next phase through a five-year commitment from Higherlife Foundation thanks to the continuing generosity of Zimbabwean-born philanthropists Strive and Tsitsi Masiyiwa. Applications for the 2019 program will open in mid-October. More information will be posted online in the coming weeks. For additional information about YYAS or its partners, visit africanscholars.yale.edu or contact african.scholars@yale.edu. Follow YYAS on Facebook and Twitter to stay up to date on program news and announcements. Higherlife Foundation may be contacted via info@higherlifefoundation.com or (+263) 772 222 922.